But hardly had she a bit of it in her mouth than she fell down dead. Some (sadly) little known facts: Snow White was not revived by a kiss! The queen tried to kill her first tightening her stay laces so she could not breathe, placing a poisoned comb in her hair and feeding her the poisoned apple. The dwarfs saved her from the first two, but were unable to revive her after the third. When the handsome prince came along and saw her in the glass coffin the dwarfs had made, he thought she was so beautiful that we wanted to take it (and her) with him. As it was being carried away, a piece of the apple that had been lodged in her throat came loose and she was alive again, and able to marry the (slightly creepy) prince. Good times, that. Not going to lie, this is my favorite shot in this series. 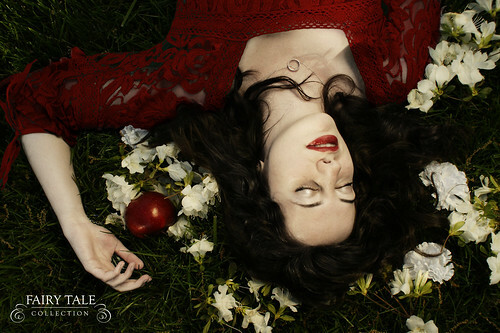 I think Emily is a perfect Snow White. This was also the first and simplest shot out of the whole fairy tale theme. Some makeup, flowers, reflector to catch the setting sun, and some editing and voila! Done. Now that she knew where he lived, she spent many an evening and many a night on the water near the palace. She would swim much nearer the shore than any of the others ventured to do… She peeped out from among the green rushes, and if the wind caught her long silvery-white veil, those who saw it believed it to be a swan, spreading out its wings. One of the ideas from Hans Christian Andersen’s original story that always stuck with me was this: “every step you take it will feel as if you were treading upon sharp knives.” It’s a rather sad story. Here’s a link to the long, sad story. Fun fact: in “Little Red Riding Hood” as told by Charles Perrault, Little Red Riding Hood dies. And that’s the end of the story. 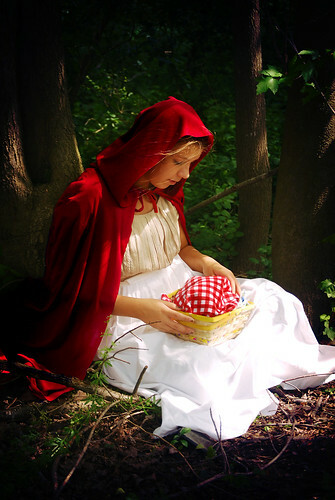 To read the lovely moral tale of “Little Red Riding Hood,” click here.